It’s Saturday August 15, as I sit in the sweltering heat with a mild hangover. I’m hot, hungry and cranky with the oddest of all cravings. Yup! 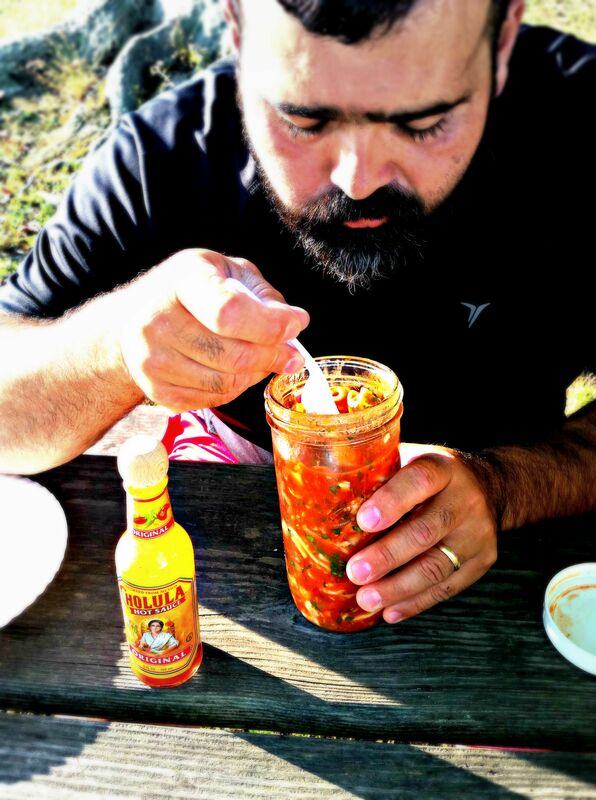 you guessed it; for a nice cold bowl of Ceviche. But not just any Ceviche, Colombian style Ceviche. Yes, I could have just gone off to my favorite local Colombian Restaurant restaurant and bought a container full, but no, of course not!! Instead I head to my local market and start to gather the ingredients to what my palate recollects. The final product was AMAZING!!! Maybe not exactly the way their’s taste, but in my opinion (and my husbands) BETTER! Its the perfect pack-able meal for a hot summer evening. I divided the Ceviche into mason jars along with a bag full of my FRESHLY MADE CROUTONS, and headed to the lake for dinner. Keep in mind that I don’t know how to make small of portions of anything, so feel free to reduce the amounts to half if you prefer. This recipe made at least 8 cup servings. Traditionally, Ceviche is made with raw fish and allowed to cure with the lime juice. I couldn’t bring myself to consuming raw fish so all of my seafood was cooked thoroughly. Try it out! Let me know what you think! 1. Begin by prepping all of your seafood. Peel & devein shrimp, cut calamari into rings, rinse fish and cut into large chunks ( hand palm size). In a large pot bring water to a boil, adding 1 tbs salt and vinegar to water. Drop shrimp into water and let cook for just a minute or so removing with a skimmer or slotted spoon. Repeat the same process for the calamari and fish using the same water. Be sure to remove the skin from the fish after its cooked. The idea here is to cook your seafood but not over cook it. Use your judgement. I personally do not like under cooked food, especially fish. Let Cool. 2. 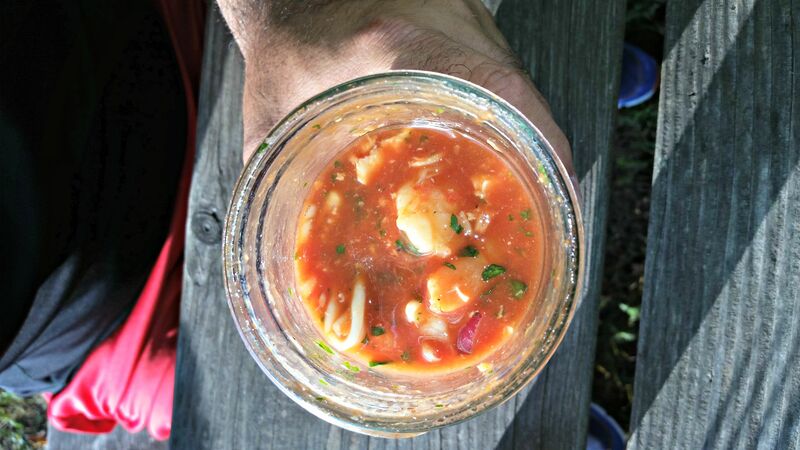 In a large non reactive lidded container (I used a gallon size mason jar), place your seafood and begin adding all of the other ingredients in that order. 3. Cover tightly and begin to shake and move the container lightly until all of the ingredients have incorporated. Shaking or stirring too vigorously will break apart your fish and make it mushy. Be sure that your seafood is covered completely in the liquids but not drowning or watery. Tomato juice can be added if needed. Let it cool completely in the refrigerator for at least 3-6 hours or overnight. 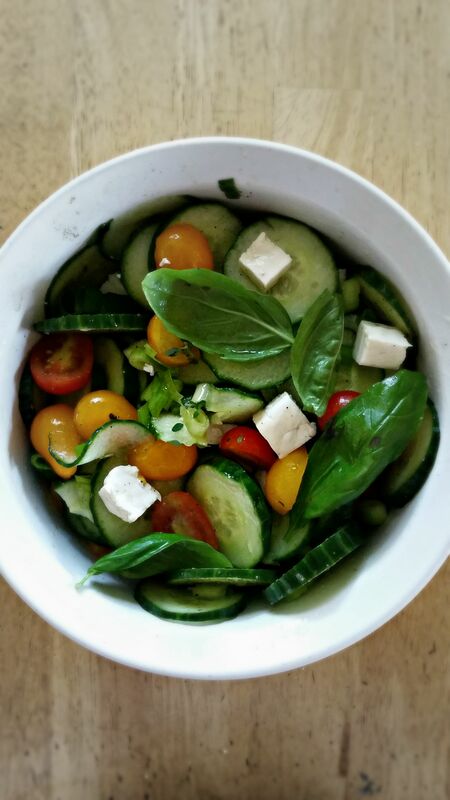 Super simple salad with most of the ingredients right out of your own garden. Pair with grilled chicken to make this a super low calorie dinner. Wash chop and prep all of the veggies. Toss in a small bowl with salt and pepper adding the olive oil and vinegar. Garnish with the cubed cheese and basil leaves. 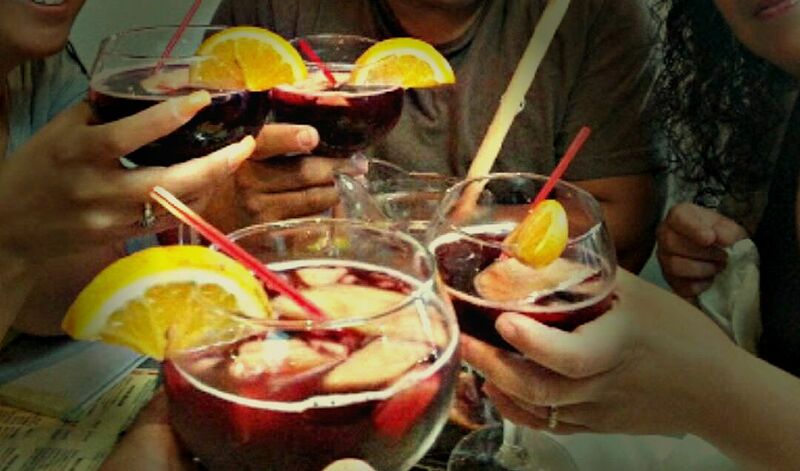 In our house, Sangria doesn’t have a season. We drink this fruity concoction whenever we want to celebrate absolutely anything. But with summer at its peak we cant help but make a cold, sweaty pitcher at least twice a week. I’ll share my recipe so you too can enjoy a glass. 1. In a large sangria pitcher, add all of the fruit, sugar and liquors. With a wooden spoon, mix and crush the fruit a bit to masterate. Add the wine and orange juice, mix well. 2. At this point if you want to add ice to the pitcher, do so. I only add ice to the pitcher if I’m serving the entire thing right away to prevent it from getting watery. I like to add the ice to the individual glasses instead. 3. Top off with soda, but only stir once softly. * Guayaba is a tropical fruit that is not easy to find. It can be substituted with white flesh guayaba or omitted altogether. Today is most definitely a Waffle Day. In a medium bowl, combine all dry ingredients and mix well. Start adding all wet ingredients but do not mix or stir until all 3 have been added. With a large spoon, mix until well combined but do not over mix or beat roughly as this will make a tough, doughy waffle. Grease waffle iron with butter (top & bottom) and pour about 2/3 C. or so* of batter onto griddle, close and cook until steam stops. Garnish with butter and syrup (I like lots) & Enjoy! 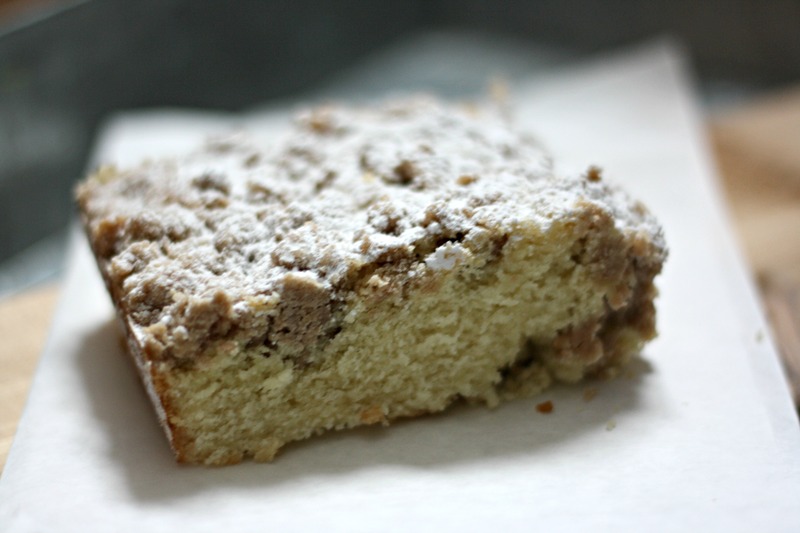 I PROMISE YOU WILL LOVE THIS CRUMB CAKE!! It’s made with a delicate combination of the best and easiest basic yellow cake recipe I’ve ever made, along with a perfect crumb topping. The cake is fluffy, soft and just so delicious! Basic ingredients, no fancy equipment and super easy. Honestly, I even think My BFF Marge (who has a severe allergy to the kitchen) can pull this off. The recipe indicates that a stand mixer is recommended BUT I used my handy 19 year old hand mixer and it worked out just fine. Try to think back to the times when these fancy mixers didn’t even exist and everything was done by hand. Cakes and breads were still baked and nobody died. I used my favorite cake recipe that was featured in Shanna Mallon’s blog foodloveswriting.com, but the recipe was actually Created by Chef Cathal Armstrong, owner of Restaurant’s Eve, a restaurant in Alexandria, Virginia. I’ve adapted the crumb topping from my friend Beth who got it from someone who I’m sure got it from someone. Her original Crumb Cake recipe used boxed cake mix but I wanted something a bit more original and decided to use Restaurant Eve’s Cake with Beth’s topping. So with that being said, I had to tweak the instructions a bit to make it work since boxed cake mix is denser and harder and this cake has a personality of its own. 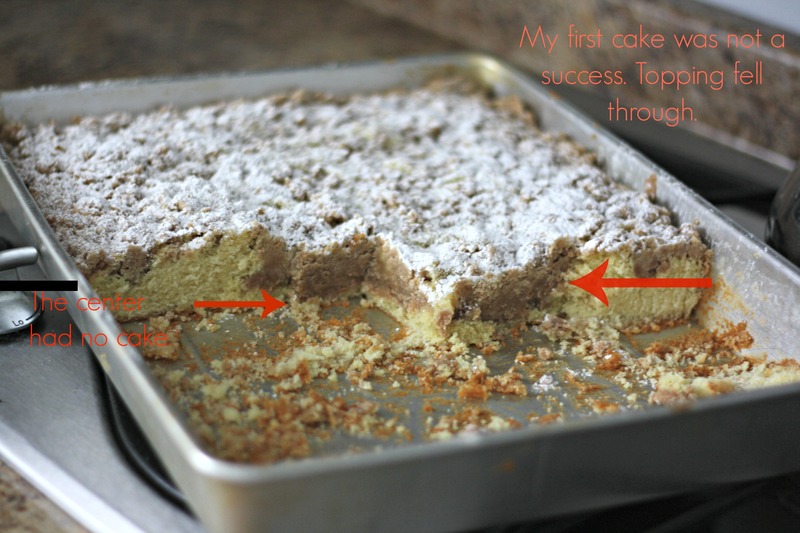 The cake is light and fluffy where the topping is thick and heavy so timing is everything. The cake recipe below is for an actual cake, not a Crumb Cake so I have added steps (1-5) to make the instructions for the Crumb Cake a bit more clear. The text in Italic is what we will be changing for the crumb cake. A bit confusing but please, bear with me here! Start by making the cake batter (Steps 1-4). 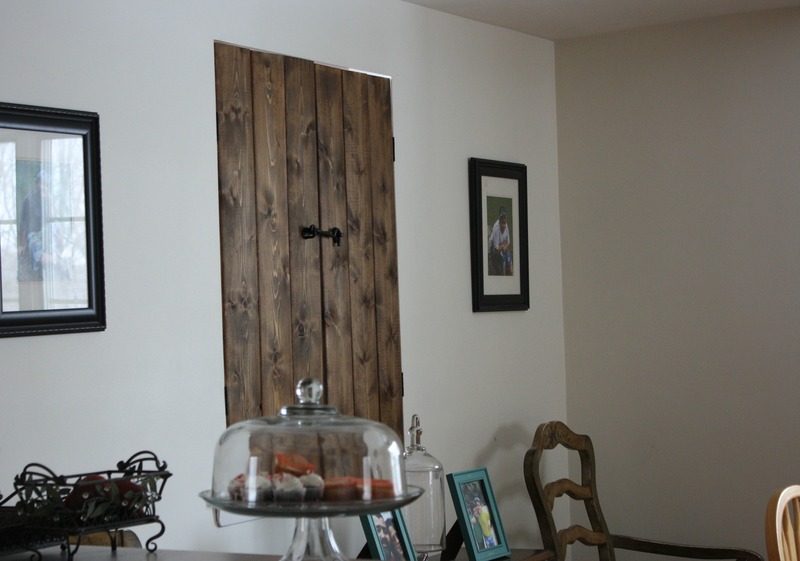 But instead of baking the cakes in two 9″ cake pans, I suggest using one 16 x 12 inch or two 12 x 9 inch pans. The idea is to have very thin cake so that your crumb topping does not fall through the batter. Bake your cake at 350° for 19 minutes or until the center is no longer liquid but not fully cooked either. (Make your crumb topping during these 19 minutes). Make topping. In a large bowl Melt the butter and to it, add the flour, sugar, cinnamon and vanilla. Mix well until all the butter is absorbed. 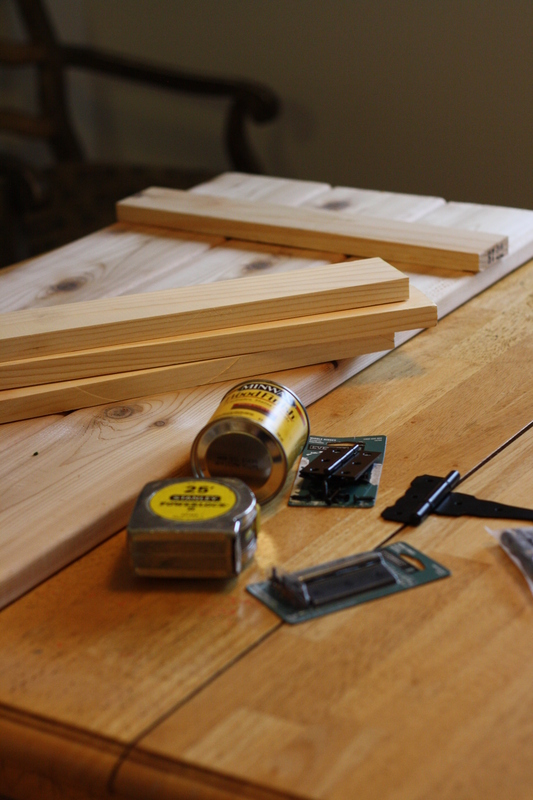 Use a pastry cutter to break up large pieces if necessary or just your fingers. Remove the cake from the oven and quickly spread the crumb topping to your cake. If the top of the cake cools, the topping will not stick. Return the cake to the oven and bake an additional 19 minutes. Let cool and douse with confectioners sugar. Enjoy! Step 1 Preheat the oven to 350 degrees. Lightly grease and flour two 9-inch cake pans and line the bottoms with parchment paper. Step 2: Melt butter and let it cool to room temperature. Step 3: Combine the sugar, flour, baking powder and salt in the large bowl of a stand mixer (A stand mixer is preferable for this recipe, though a hand-held electric mixer may be used.) On medium speed, add the butter, incorporating in several additions. Beat for about 2 minutes, or until combined; the texture should resemble cornmeal. Step 4: In a separate bowl, combine the eggs, vanilla extract and milk. Add to the flour butter mixture in two batches (scraping the bowl once), and beat on medium speed for 2 minutes, or until smooth. Step 5: Distribute the batter evenly between the two prepared pans. Bake for 35 minutes, or until a toothpick inserted into the middle of the cake comes out clean. Transfer to a wire rack and cool for 20 minutes. Remove cakes from pans to cool completely. Frost the cake. It can stand at room temperature for 1 hour; otherwise, cover and refrigerate until ready to serve. On Tuesday night I made a fabulous Chicken Cordon Blue. 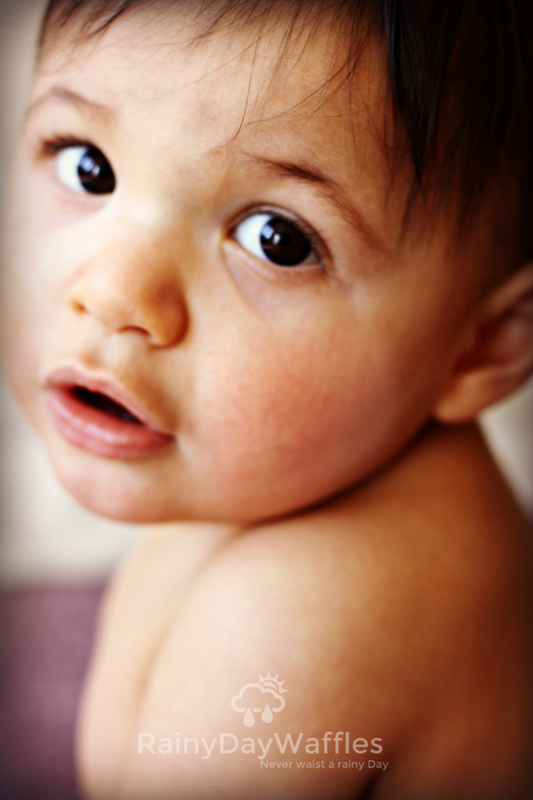 On Wednesday I did a photo shoot for my neighbor and her baby Braydon. 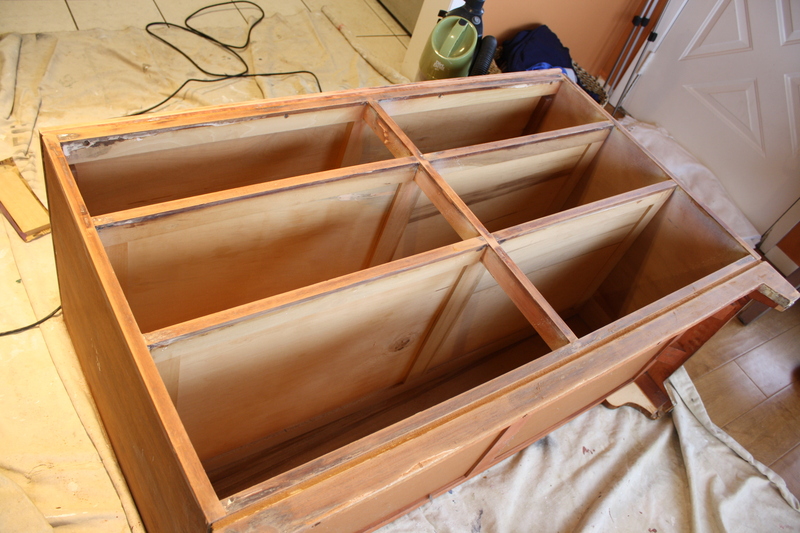 On Thursday I finished stripping and sanding a dresser and primed it. 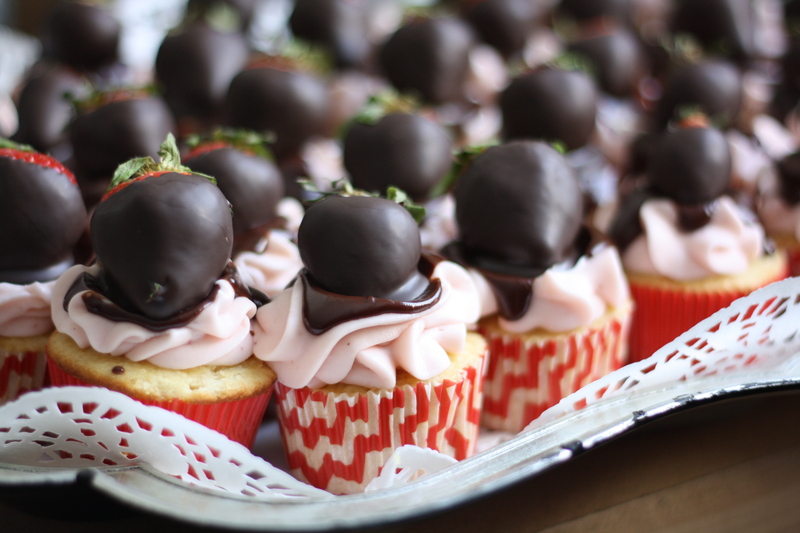 On Friday I made 3 dozen chocolate covered strawberry’s and 64 of these amazing chocolate covered Strawberry Cheesecake cupcakes. I even pulled off this spinach pie for dinner! It was amazing!! 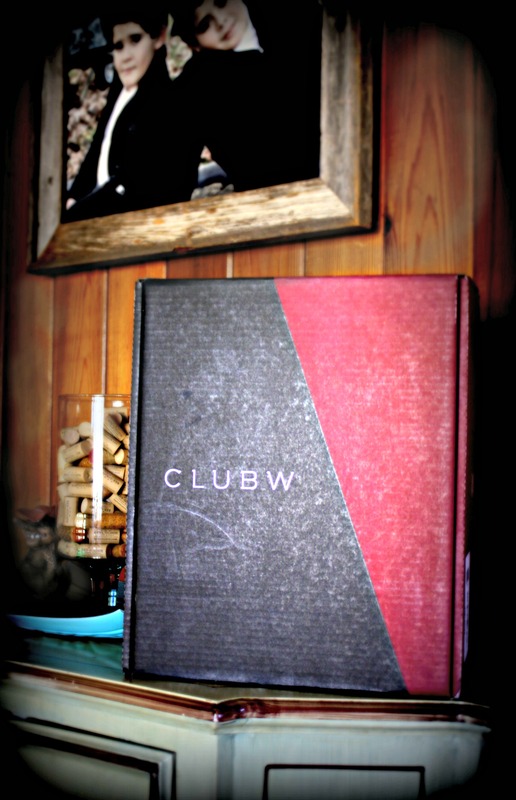 Just received my very first Club W wine delivery. After much time of contemplating on whether to start on one of the many wine clubs available, this one finally convinced me. I love trying different wines from different regions but I’m always so skeptical about making choices when wandering through my local wine shop. 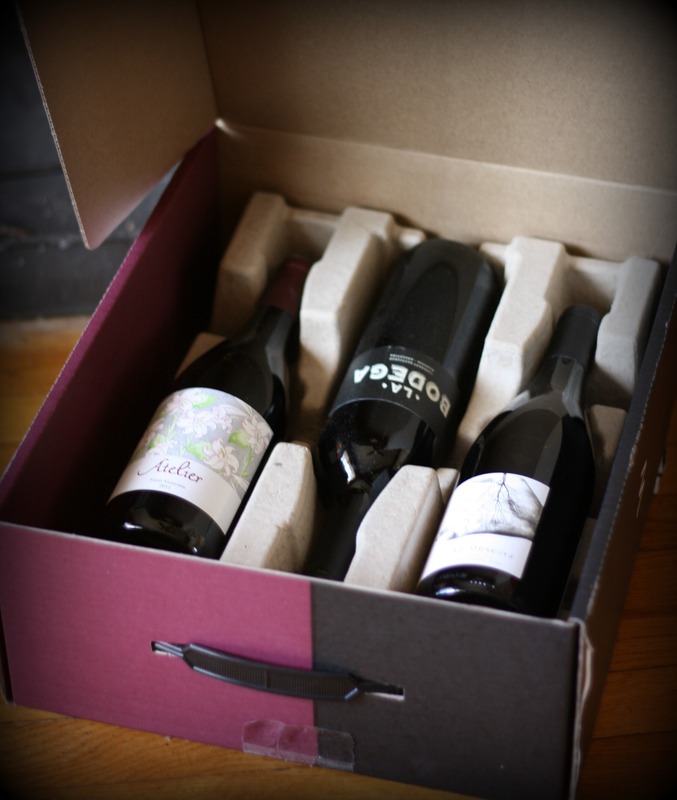 Club W offer small batch wines from all over the world at $13/bottle (curators choice up to $23) plus $6 flat rate shipping. For the winter we are getting here in New York, the $6 shipping sold me. In January new customers were offered 50% off of their first order so I got 3 bottles for a total $27.16 including the shipping!!!! What a freaking bargain! 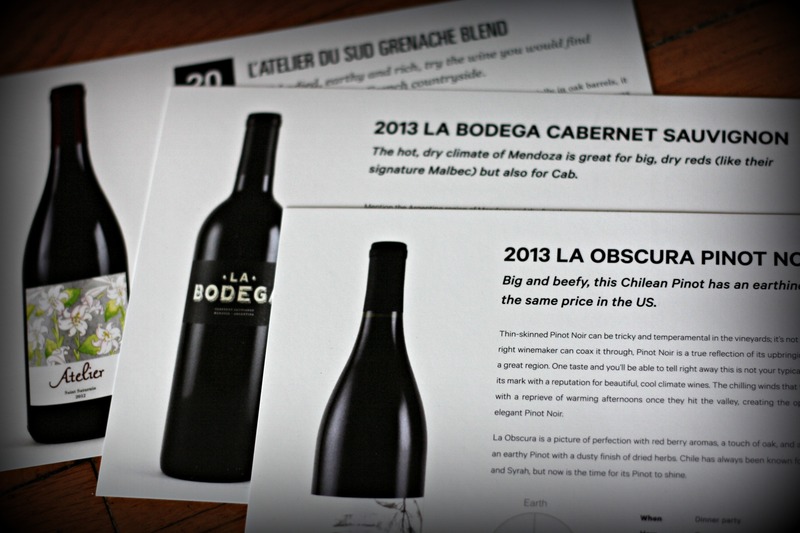 Each bottle comes carefully packaged with it’s own descriptive recipe card. You can skip a month or cancel altogether at anytime. Use this special link to get one free bottle on them just for trying them out. So what’s there lose? Give it a try! Like what you see? Enter your email to stay in the loop!